Celebrating the 101st birth anniversary of Christ Ahnsahnghong, the 73rd Overseas Visiting Group came to Korea from 62 churches in 10 countries of five continents—Asia, Africa, North America, South America, and Europe. The New Jerusalem Cultural Con -tents Awards Ceremony 2018, which is an integrated awards ceremony of the 19th Melchizedek Literary Awards, the 4th Elohim Video Festival Awards, and the 4th Bible Seminar Presentation Awards, was held at New Jerusalem Pangyo Temple in Korea on December 2, 2018. On November 11, the Church of God held ASEZ Talk Concert on Confronting Climate Change 2018 at a seminar room of the New Jerusalem Pangyo Temple in Korea to draw global attention to climate change and to share creative visions and opinions of university students who are the leaders of the future generations. The year 2018 marks the 100th anniversary of Christ Ahnsahnghong’s coming to the earth a second time to restore the new covenant as it was prophesied in the Bible. On November 20, the Church of God members all around the world made a firm determination to accomplish the mission to preach to seven billion people at the New Jerusalem Preaching Festival launching ceremony held by nation and region. The Church of God received the Green Apple Awards which is known as one of the world’s four major environmental awards on November 12, 2018. On November 1, the Arise & Shine 2018 Global Bible Seminar was held at the New Jerusalem Pangyo Temple. It was held with a motive to help all mankind have correct knowledge of God so that they could be saved. Seven experts in the fields of education, medicine, engineering, and so on, gave presentations at the seminar. A total of about 2,500 people, including visitors from overseas, the members from the Church of God, and their neighbors interested in the Bible, attended the seminar. 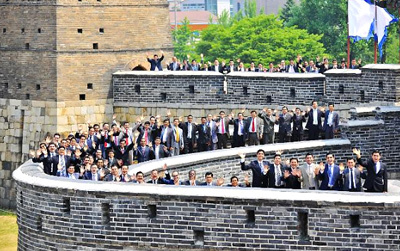 In celebration of 100th anniversary of the birth of Christ Ahnsahnghong, about 140 pilgrims from 87 churches in 25 countries such as the U.S., U.K., India, Nepal, Philippines, Mongolia, Brazil, Mexico, Ecuador, Peru, and Chile, visited New Jerusalem in Korea as the 72nd Overseas Visiting Group. The ASEZ Global Forum was held at the Church of God in Faucett, Peru, on October 17, about a month before the Talk Concert on Confronting Climate Change. The ASEZ Global Forum is an event where citizens and experts from various fields gather and discuss the ways to realize the SDGs collaboratively with the ASEZ members as the center. Starting from Pangyo New Town in December 2017, the Church of God has held the event in major cities around the world. 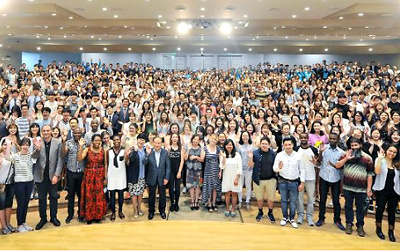 The 15th Foreign Language Bible Preaching Contest was held at the Okcheon Go&Come Training Institute on October 14 to produce global talents who will lead the world according to God’s will. 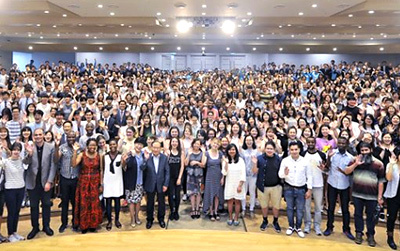 This event was attended by more than 5,000 members, including Korean pastoral staff members and members who have been studying foreign languages steadily with the vision of overseas mission.